Facet joint surgery is a serious consideration featuring a variety of significant risk factors. However, surgery is one of the few therapies that can provide a true and lasting cure for facet syndrome. Surgery is never a topic for lighthearted discussion. Although some doctors will downplay the seriousness of minimally-invasive procedures, it is vital to understand that all operative techniques have the potential to injure or even kill. It is just as important to know that surgeries may not even be indicated, necessary or effective for treating various facet joint diagnoses. This is surely one of the most important resource sections on this website. If you have been advised to have surgery, or are currently considering facet joint surgery, then the essays in this section are truly must-reads for you. This investigative report evaluates the benefits and risks of surgical facet joint care and contains a variety of topical essays that profile each procedure in vivid detail. Facet joint operations are usually reserved for cases where the diagnosis can be absolutely verified in advance of treatment. This usually entails a rather long and detailed diagnostic process, which is a very good thing. Failure to perform complete diagnostic processing is the main cause behind unsuccessful treatment of all types and especially failed surgeries. There is nothing worse than undergoing surgery and having the suspected facet joint culprit “corrected” only to continue suffering pain or even exacerbated pain, postoperatively. When surgery is deemed to be needed and indicated, it is best to find the technique that will accomplish the primary surgical goal with as little damage as possible. This means choosing minimally invasive practices when available and avoiding procedures that will affect surrounding spinal structures. The less invasive the surgical technique, the less chance for complications, the faster the recovery process and the better the treatment results will generally turn out. We tend to recommend procedures that utilize laser or endoscopic practices versus those which use larger incisions and any form of muscular dissection to access the spine. Additionally, we highly discourage any operation that holds any chance of ending with a spinal fusion. Remember, the spondylodesis procedure is the most dangerous in the entire spinal surgery arena Complications are inherent and most patients will require follow-up surgeries at a future date, post-fusion. Some techniques can be used to confirm the diagnosis and can be easily repeated to achieve permanent results, such as rhizotomy and nerve ablation procedures. These should usually be performed ahead of more invasive care options, except in cases where the diagnosis of a compressive neuropathy or operable osteophytes are verified as the symptomatic source. Facet rhizotomy is a common form of surgical symptomatic care. This technique can stop pain temporarily or permanently, but does not address structural issues in the joint itself. There are other types of facet joint nerve ablation also, including the use of radiofrequency, cryotherapy, thermal, chemical and laser technologies. Failed facet joint surgery is far more common than most patients know. Learn why so many facet joint procedures fail to provide good results and why some operations actually make the pain much, much worse. Facet joint procedures each have different surgical goals. Some address the structure of the facet joint, while others target the painful nerves. Remember to choose the best operation for your needs and understand the exact intent of any surgical consideration. Facet syndrome surgical consultations can be unnerving and even exploitative. Learn how to face a surgical consultation armed with the knowledge you need to make informed decisions about spinal surgery. 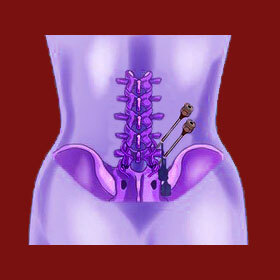 Spinal fusion for facet joint pain is often added on to dramatic surgeries, such as laminectomies. Learn why fusion is one of the worst possible treatment routes for virtually every patient. Foraminotomy for facet syndrome are used to free compressed nerves that have been trapped due to reductions in neuroforaminal patency caused by facet joint osteophytes. We generally advise patients to avoid spinal surgery whenever possible. However, there are times when logic overrides this advice and even we agree that surgical intervention might be the best treatment path for particular patients and particular diagnoses. Facet syndrome is certainly one of those times. After all, for many facet-related diagnoses, the procedures used as minimally invasive, generally successful and do not overly disturb the remainder of the spinal anatomy. Before acquiescing to surgery, be sure to learn all you can about your many options for enjoying facet joint relief in our resource section of the same name. There is more than one path towards a cure and some of the information you will read might just save you from unnecessary surgical treatment and may even save your very life. Our proven pain relief program has saved tens of thousands of patients from needing spinal surgery. It just proves that a cure is possible without invasive care for most patients. You can get help 24/7 with our proprietary approach.